In New England, the heroin epidemic has crawled into the early days of 2016: In the past week alone, eight people have reportedly died from a lethal strain called “Hollywood” that is currently coursing through Massachusetts. State police aren’t sure how long the drug has been circulating, according to CNN, and they’re only clear that the strain is called “Hollywood” because of the drug’s packaging. The victims died in Holyoke, Chicopee, and Springfield, where local cops are warning their constituents about the strain’s name in hopes of saving lives. 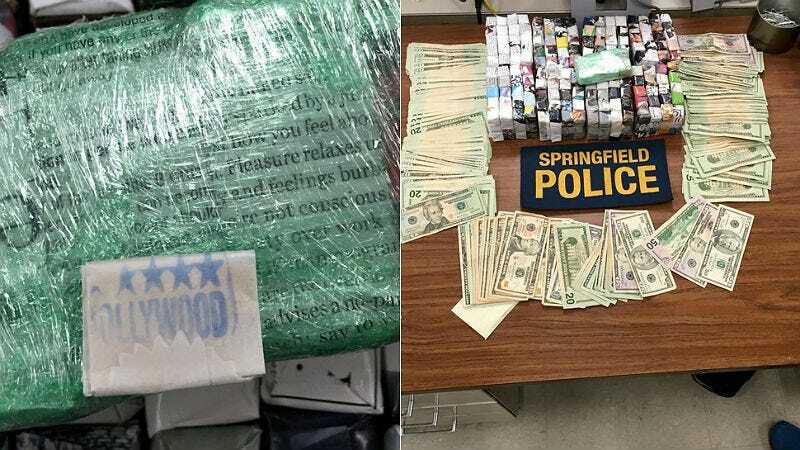 Local police also seized 9,000 bags of the drug over the weekend and arrested four people in connection to the bust. “Just like in all of New England, Springfield does have a heroin problem,” Delaney said. While this is an abnormal number of overdoses in a short time, heroin is a problem in Massachusetts, said Albert of the Holyoke police. That’s why police decided to address the public about this deadly strain. Massachusetts saw a 63 percent increase in opioid-related overdoses from 2012 to 2014, according to the state’s Department of Public Health. Nationally, deaths from an overdose peaked in 2014 and continue to rise, according to the Center for Disease Control. Image via Springfield, Massachusetts Police Facebook.